"Jacob Marley is alive and well. And what’s more, he’s the boss of you. "You’re a lowly clerk in young Jacob Marley’s powerful investment firm, which lends money to needs people throughout the city of London. Marley has decided to elevate one lucky clerk to the status of “friend,” meaning a partnership in Marley’s business, a handsome promotion, and Marley’s lifetime friendship. He’ll even get you out of Hell if you manage to outlive him. Such a deal! "To make the most points with the boss, you must lend his money to the most trustworthy clients, and stay away from the ones that will ruin you. If you’re lucky, you’ll even grow up to be as stingy and horrible as he is. 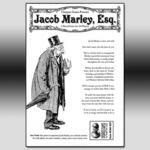 "Jacob Marley, Esquire is a banking game with all the fun and excitement that implies. No, seriously, it’s good. "As a clerk in Marley’s investment firm, you are given an account of £12 to lend to various ne’er-do-well clients in London. Each turn, you move Marley through the streets of the city, randomly affecting the economy of London with a cool Economy Chart. Then you can see what’s going on in the street where Marley stopped. Will you lend your money to a lawyer, a financial institution, or a petty criminal? The choice is yours, but make sure you’re not the only player with a client like this, or it can cost you a bundle of money and points!" A play test version of this game was available from the Cheapass web site for some time -- and may still be there at http://www.cheapass.com/free/games/jacobmarley.html. The version which was subsequently published is significantly different, and (claims Cheapass, with some justification) much improved.